The Memphis Time Quilt is a fun, nostalgic, skill-building quilt celebrating 1980s fashion watches and the Memphis Milano design resurgence. 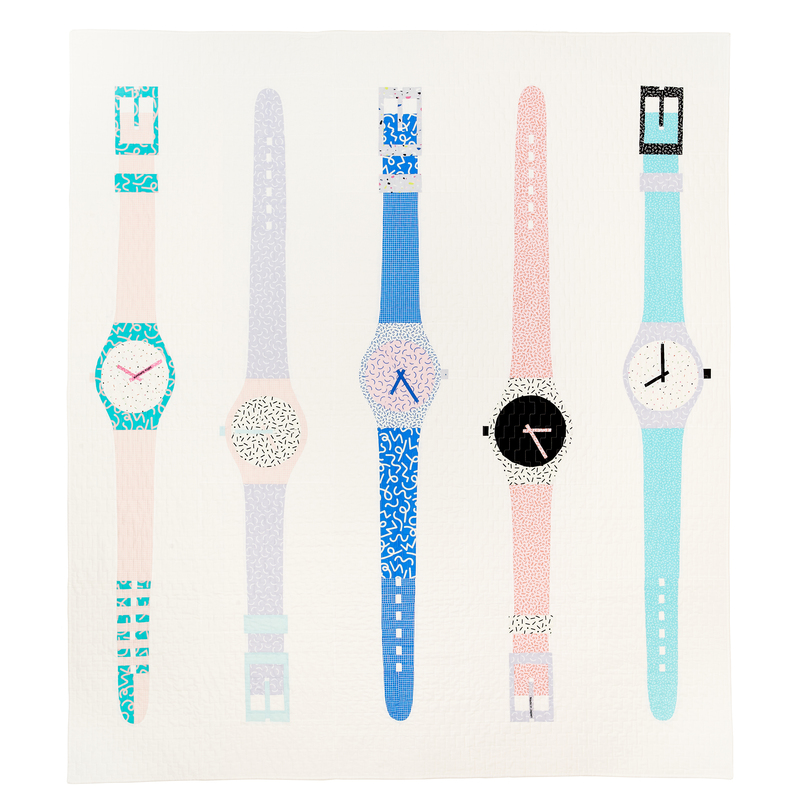 Have fun with your favorite fabric prints to customize your own watches! Assembly includes straight piecing, curved piecing, piecing from templates, foundation paper piecing, and appliqué, so there is never a dull moment. Clear, illustrated instructions are included for every technique in addition to the general assembly instructions, so fear not, confident beginners! Below are links to videos and tutorials that will help in making your Memphis Time Quilt! NOTE: There is enough excess in the Watchband, Watch Case, and Watch Face fabrics to also yield the smaller elements (crown, loop, watch hands, buckle). Selvedges can be used for Watch Hands and Buckle Prong. Yardage was calculated to account for shrinkage if you are pre-washing. However, please purchase extra fabric if you intend to fussy-cut any pieces. *Digital cutting machine users: you will need 1¾ yards of background for one block; 6½ yards for the Twin/Full Quilt. All other yardage requirements are the same.